I think I am falling in love with felt again. Actually, I know that to be true. One reason is the wonderful wool blend and 100% wool felt that is so readily available. My go-to source for wool blend felt is Benzie Design. 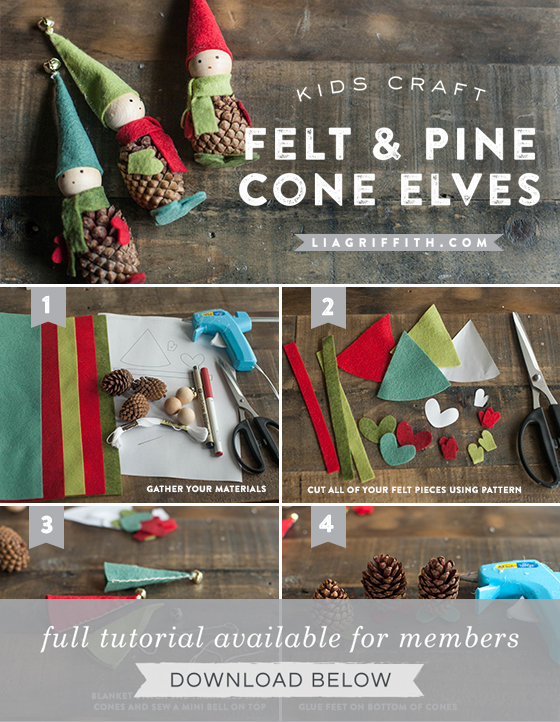 Remember the felt turkey tutorial and the felt pine cone owls? It seems felt and pine cones make a wonderful match, especially when crafting with kids. 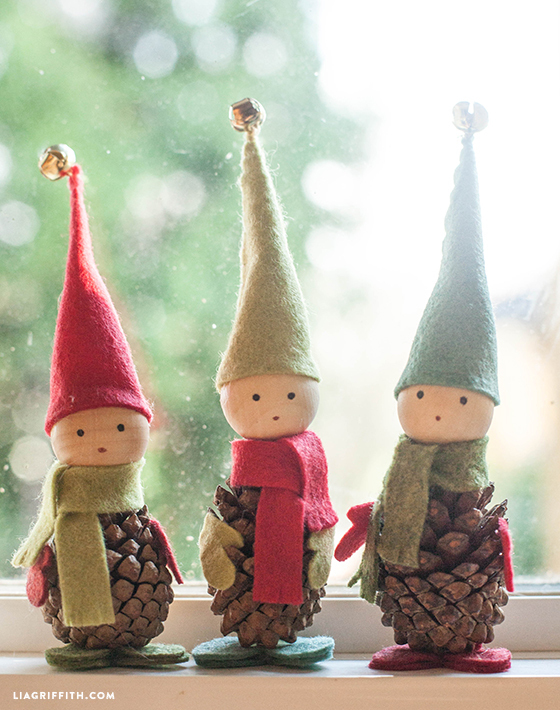 Today I combined them to make these cute felt and pine cone elves. Highly influenced by two of my team members who are Scandinavian, it seems these holiday pine cone elves are a perfect craft for December. For this project, I chose five felt colors—red, brick, fern, moss, and blue spruce. I love that color combo! I found mini pine cones, 1-inch wood beads, and tiny jingle bells at my local craft store. With some scissors, hot glue (you can substitute tacky glue), and black and red pens, these little elves come to life so simply. 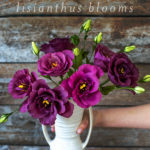 Oh, what fun you can have making different variations! 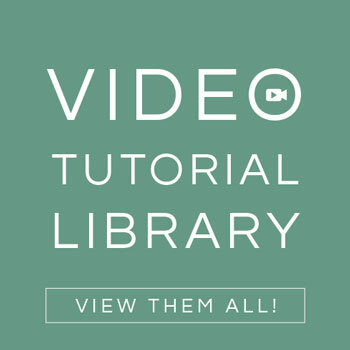 Below you will see my step-by-step tutorial and a brand new video tutorial! 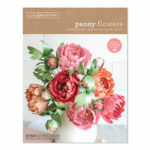 Download the PDF template for the felt pieces to cut. Or you can download the SVG file for your Cricut Maker to cut. Gather the kids around and do a little seasonal crafting today! We have lots of pine trees on our road, so I can gather them, for free, and make some elves! Oh, happy! Thanks so much for sharing your patterns and talent with us all! Again, you’ve drawn the pattern in color which I cannot print without a color cartridge which I cannot afford. This looked just perfect for an elderly community project. Now I’ll have to try and recreate it by hand. Please don’t use color patterns for those of us that do not have color capabilities. Cynthia, all black & white printers should have the capability to print color in grayscale. I’m I missing something but what size wooden ball are you using? Thanks much…these are too cute! these are are so cute. I found large Christmas mugs at the dollar store and tied three elves around with gold ribbon which looks even better. Thanks for letting us know, Sandy! With the neighbor’s Pine trees depositing loads of Pine cones in our yard. ..this elf project and all others is too perfect! I noticed the pattern has two different sizes. Is this just for adjustment to pinecone sizes? A friend just sent me a pic of the pine cone elves which I plan on trying. My father was very Danish and you mentioned your partners are Scandinavian. 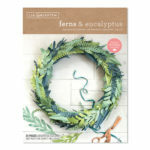 If you check out the website Gingerbreadsnowflakes, you’ll see lots of Scandinavian ideas. I make Swedish wood shaving ornaments and they are on that website. I’m winding down for this year but will be up and running next fall. It’s something I’ve been doing for 35 years off and on. Now it’s on because my son is cranking out the shavings by the bags full. I just joined so that I could print out the pdf pattern for the pine cone elves. The trouble is, when I print, the triangles don’t print. Can you help me with this? How strange! The only think that I could think is maybe you are out of printer ink? Are you able to pull up the template without a problem? Thank you so much for including this project!! Happy holidays to you! These are adorable! I can already picture them hanging from my windows/Christmas tree! We are going to make this craft project in our group Magiche Donne Creative next week. In case we wanted to make a small donation as a gratefulness gesture for you sharing the idea, what would be the best way? Thank you so much! This is so sweet! The best gesture of gratitude would simply be to share our site with your friends and encourage others to become members 🙂 I am so glad to hear that you will be doing the craft with your group, that will be so fun! Feel free to email some photos so we can share them on our page 😉 Happy holidays to you! What size pine cones are used? It’s hard to tell. I used the same pine cones that you have pictured for these adorable little guys. Problem, is the next day the cones opened completely up all the way. All that work, and now I have these funky looking things. Disappointed. Oh no!! Where did you get your pinecones? If you find them outside there is definitely a risk that they will continue to open up. We got ours in a pack that we bought at Michaels and we didn’t experience any issues. I’m so sorry this project didn’t work out! Love, love the elves! 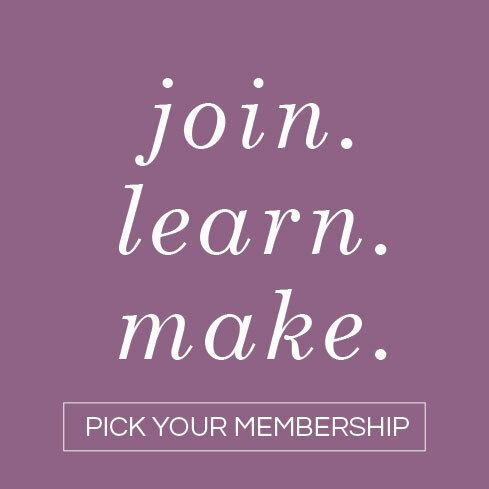 How can I purchase the pattern and sign up for a membership? i would like to purchase the felt pine cone elf pattern. how can I just purchase this and not a subscription. thanks! Love this idea. So adorable! You could also use the round wood beads for the head and put the tip of the pine cone in the hole with glue. That is a great idea too!! Absolutely love this idea! We are trying to do this for an activity at my work, but we won’t have access to needles or threat to make the caps. Is there any other way you suggest, like using craft glue? We need it to be as simple as possible for adults and teens and (possibly) children. Thank you for your time! You can absolutely use glue. I would suggest a low temperature “hot glue gun” the key is low temperature when it comes to glue guns but any type of glue that works with fabric will also work. Have fun! Stop, how cute are these? Love the idea. My mom is big into making little favors like this for the holiday so I’ll be sharing this idea with her! Ma sono troppo carini! Da fare assolutamente! You could also add a small thin ribbon and hang them as ornaments. I adore these elves! Do you know what size pine cones and bells you used? Thanks so much! The balls we used for heads were 1″ so I would suggest a pine cone that is proportional to that, we picked ours in the forest so they varied a bit in size. You can also get larger or smaller heads depending on the size pine cone you find. Happy Holidays! How do you get the patterns for the elfs and owls?? 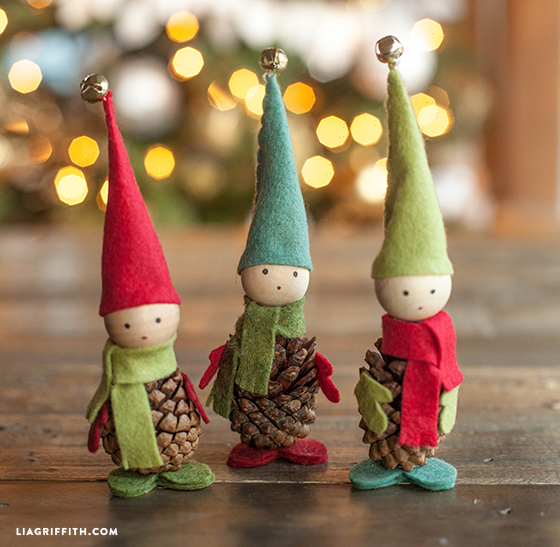 These pine cone elves are simply ADORABLE! I will definitely put these on my Christmas crafts list this year…i have many pine cones to work with! Im always on the lookout for what to make with them. Great! We have lots more ideas for using pine cones coming, wish we had a tree with pine cones in the back:-) Would be so handy! Absolutely charming! I simply cannot stop making these. Thank you for sharing your project. I made one of these dear elves all in bright pink shades for my friend who is undergoing breast cancer treatment. On the hat, I added a small version of the folded breast cancer pink ribbon emblem (made from transparent bright pink ribbon). This turned out sooo cute and my friend loved it. I think you should feature this elf pattern again with the custom color idea. Thanks for a great pattern–love your site. Marcie, I love what you did for your friend!!!! Your comment made my entire week, thank you for sharing. I will definitely have to make one! Hugs to you and your friend! So cute, and I bought all the supplies. A question, when I printed the patterns for the hat, gloves, and mitts,I see it has two sizes. Which should I use ? I have the 1 in. wooden balls. thank you. I did two sizes since it depends on the size of the pine-cone. The small one is for a 2-3″ pine-cone. The best looking Elves yet! I want to keep them around all year and change out their clothes – Hawaiian shirts for the summer maybe? A good reminder for my kids to be kind all year round. Thanks for sharing! aaaw these are soooooo adorable and cute! love them, and like them even better. Love these elves!! And I have all the makings for them too-gotta get to work!! Perfect, hope you have a blast! OMG these are SO cute! Got to try some… its been pouring with rain so I’ll need to dry out a few cones but these little folk will just have to stand on my mantlepiece this year! Thanks so for sharing. I love this craft. Been doing a lot of your flowers and now working on the birds. I guess the elves will be next. Can’t wait to get started. I cannot stand how cute these are. I am now officially addicted to your site. I. Must. Go. Back. To. Work. Thank you again for sharing your brilliance with the rest of us! Боже мой,Лия! Я впадаю в детство!…. Эти эльфы не дают мне покоя.Они чудесны! Спасибо,Лия! Wow, these little guys are adorable. Cannot wait to try them with my son. He will love it. I will have to find a substitute for wooden balls though. 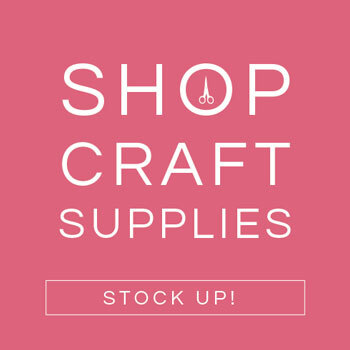 We don’t find specific craft supplies that easily here in India. I will bet you can find something. You can always paint a small ball tan. possibly use a ping pong ball with a bigger pinecone? That is a great idea!! Share photos. So adorable! Will be making these at our annual Santa Cookie party this year with the grands! Thanks so much for the patterns. These are so darn cute, makes me wish I had small children……..or a pine tree!! Oh my these are adorable Lia. I’ve been all over Pinterest & Etsy looking for a pattern. The felt shoes are brilliant! Day two of my Cricut Explore learning curve. How do you condition a new mat before using? I didn’t know about “new mat conditioning.” Boy that card stock was stuck like gum on my $10.00 mat.